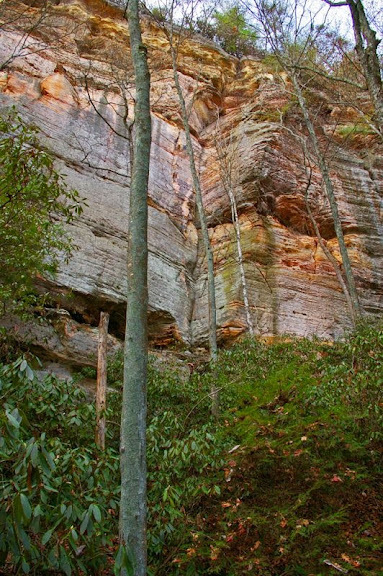 Last fall, my climbing partner Nate was exploring the area around Jewel Pinnacle in the Red River Gorge when he spotted a large wall off in the distance. After improvising an approach, he discovered a handful of appealing cracks. The cliff had no indications of previous climbing traffic. Excited to possibly nab a series of first ascents we put it on the back burner and were unable to return until this past saturday (July 13, 2013). The approach wasn’t an epic, but it wasn’t a hike either. The best way to describe it is to cross the Red River as if you were approaching Jewel Pinnacle, and then head West rather than South toward Jewel Pinnacle. 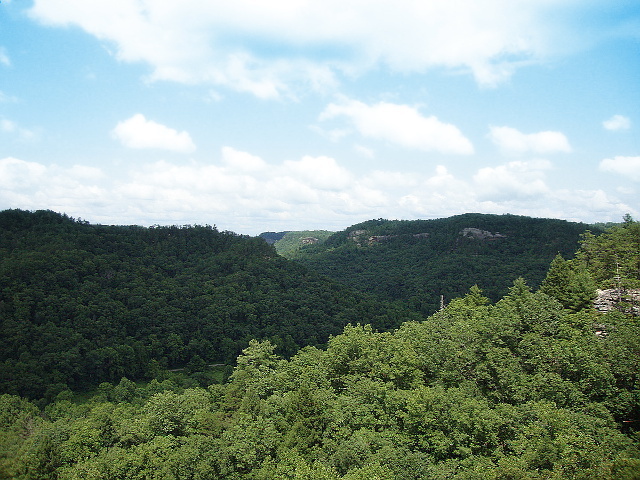 The cliff is located past the third and largest drainage while heading West. Approach time will vary based on the chosen route, but I would allow for up to an hour each direction depending on the time of year (less if it’s fall/winter due to visibility and less thrashing). It is a large cliff, capped with a moderate roof on it’s North facing side. We would later discover that it is plainly visible from KY-715 and can be identified by the smaller roof that caps the main dihedral that we would eventually climb. After arriving at the cliff, we were disappointed by many of the cracks. Nate’s memory hadn’t served him accurately in all circumstances. A few were smaller than had been previously believed, and many others were predominantly wide with questionable rock quality at the base. 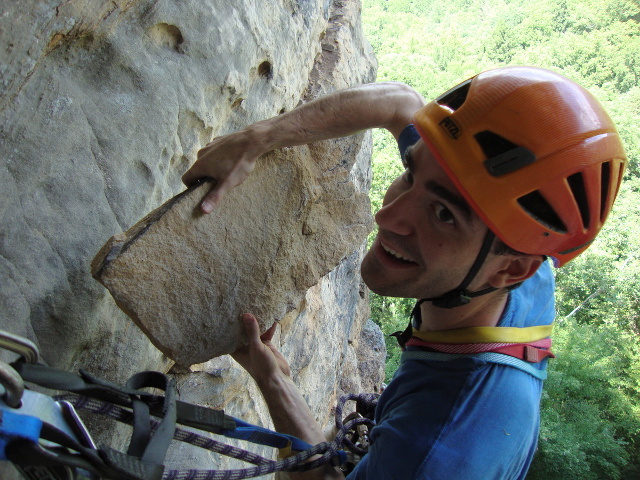 After an aborted attempt to climb what looked to be clean crack, Nate traversed up a strange pitch with "horse heads" on it to reach a ledge covered in bird droppings. After I cleaned the pitch, and carefully avoided a histoplasmosis-covered boulder, the owner of the ledge paid us a visit. 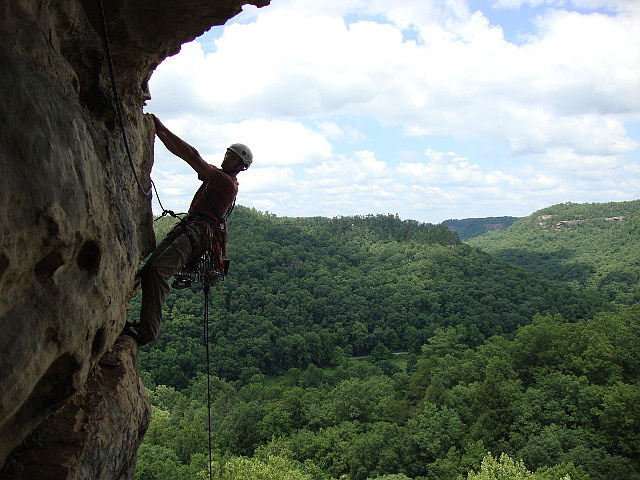 We made haste and rigged a rappel. There were no signs of gear on the ledge and we discovered no other obvious way down. If we had to grade it, I think we agreed on 5.7. Disheartened by the perceived lack of quality in many of the other routes that the cliff afforded us, we decided to go all in for the main prize: the intimidating and tall main dihedral. From the ground, we surmised that a potential route to the top the cliff existed by traversing out from the roof at the top of the crack and gaining a short crack system that would lead us to the top. Nate is a stronger climber than I and it was his discovery, so he racked up and began progressing up the climb. Despite some questionable rock low down, the climb took good gear further back in the rock. The right side was featured with some pockets which provided helpful hand and foot holds. Nate placed a handful of deep #1 and #2 C4’s in the crack before he stopped. "What is it?" I inquired after a brief pause. "Cold shuts. Very rusty and old cold shuts." He replied. Our first ascent dreams seemed dashed. These anchors were only approximately half way up the climb, so Nate pressed on. After negotiating a challenging wide start with relatively featureless rock and circumnavigating a healthy tree that guarded the crack, Nate once again was greeted by two cold shuts right below the roof. Nate backed up the rusted cold shuts with a few pieces of gear nearby and brought me up. Once at the belay, I used a bomber #.75 C4 placement to backup the anchor and we organized and discussed the climb so far and the potential continuation of the climb. We had questions. Who placed these cold shuts? When did they place them? 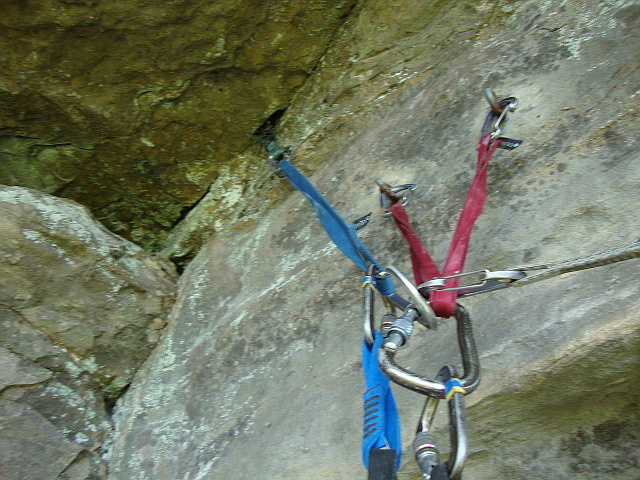 Why did they place intermediate anchors when a gear belay was readily available and when the route clearly continues? Why is there no record of this cliff or route that we are aware of? While hanging at the roof belay, Nate pointed out a particularly precarious looking block. After inspecting it and testing it, I realized it was entirely detached and teetering on the horizontal ledge. I began to find all manner of small and medium sized blocks to clear off the ledge, though one in particular was the clear winner. Taking into consideration our interest in the traverse roof pitch and the unlikelihood of any unsuspecting victims below we decided that cleaning the horizontal ledge was a logical next step. Thus, I began trundling away. The largest block made a satisfying thud that echoed across the valley as it implanted itself into the soft soil below. Having completed the house keeping, we turned our attention to the elephant in the room: were we going to do the traverse or call it quits? I had no interest in leading the traverse - the fear of the unknown got the best of me. Nate had bigger plans. 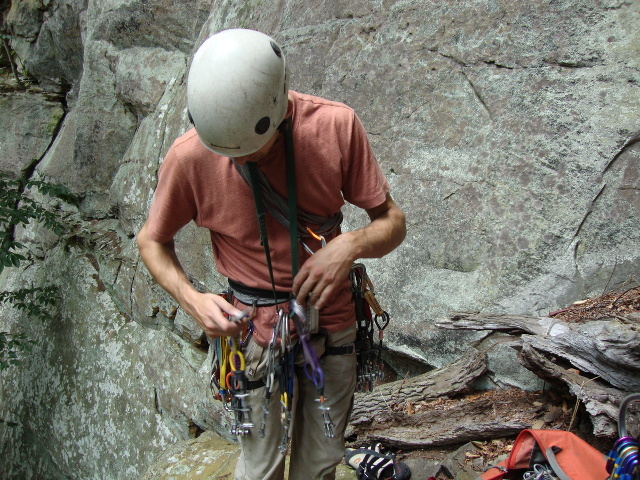 After ample safety-related discussion, Nate began the traverse. After placing a draw into the anchor itself as Nate’s "first piece" to avoid a fall directly onto my harness, he carefully progressed toward the edge of the roof. A fiddly #3 C4 placement in the somewhat flaring upper crack was his first piece of protection and it wasn’t confidence inspiring. The flaring edge that provides hand holds vanished about halfway out the traverse, and Nate was left with nothing except a small one to two finger pocket that could potentially take a small tricam (black or pink). However, this was also the only feature that could be considered a hold at this portion of the traverse and ended up being the key to the sequence for me. After expressing disdain for his lack of racked tricams, he decrypted the moves using the tiny pocket. Nate completed the beginning of the traverse, found a remarkably questionable placement for a #1 C4, and was comfortably resting on a decent hold directly on the corner that marked the end of the roof. Out of my sight and almost out of earshot, all I could do was death grip the brake strand when the rope was still and hope things were going well. Nate’s next piece was a #2 Master Cam which, while better than the #1 C4, was still not a perfect piece. It wasn’t until Nate committed to traversing even further right that he finally found a bomber #5 C4 placement. After negotiating a particularly dirty bulging ledge traverse, Nate reached a tree that marked the bottom of the top of the cliff, built an anchor, yelled off belay as loud as he could, and breathed a sigh of relief. Down below the roof, still hanging in my harness, I, too, breathed a sigh of relief. My calm was interrupted once the rope came taught and it was my turn to do the traverse. Perhaps it was the adrenaline, but I made quick work of the exposed opening moves. When I arrived at the #1 C4 placement, I was in awe of it’s terribleness. It was in an angling horizontal barely deep enough for all four lobes to touch rock and a crack on the rock above the horizontal pointed right at the cam. After the excitement of breaking off a hand hold and complaints of the dirty final bulging traverse, I joined Nate at the tree belay. A quick double rope rappel (a single 70m would be insufficient) off of two solid trees put us on the ground and the ropes soon joined us on terra firma. My respect and admiration goes to my partner and professional badass Nate W. for keeping it together on the traverse pitch. I wouldn’t hesitate to lead the lower pitch(es), but the sketchy pro on the traverse is pushing a bit beyond my current comfort zone. We avoided discussing grades until the end of the day. After considerable debate, I believe we consider it 9/9+. It’s hard to grade a route like this, so all we were left with was comparisons. It seemed considerably harder than many of the 9’s I have done and seemed to straddle many of the 9+ routes. 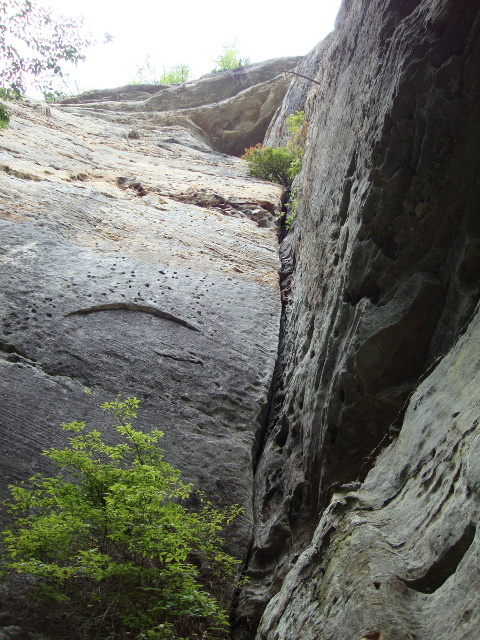 The offwidth section is challenging, and the traverse sequence was not easy either. I was mono’d into the small pocket palming on a sloper at one point with feet I could not see. As for the gear - great until the roof, then at least PG-13 if not R. There is gear, but it is very questionable. A fall would result in a swing into the opposite side of the wall which could lead to a broken ankle or leg. We had fun, and convinced ourselves that the traverse pitch was potentially a first ascent, given the number of blocks we cleaned. It would be very difficult to use the ledge while it was covered with loose blocks. The cold shuts beneath the roof showed rust despite being very protected, while the lower cold shuts were flaking, so we know that their history is far from recent. Thus, we have questions, for the most part purely to satisfy our own historical curiosities. Does anyone have any record of this cliff or route? Who placed the cold shuts? When did they place them? 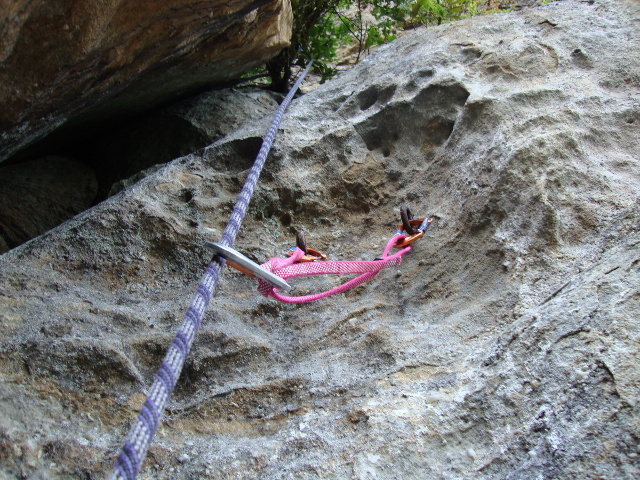 Why did they place intermediate anchors when a gear belay was readily available and when the route clearly continues? Any speculation or insight is welcomed! I have absolutely no information to contribute, but did want to say that I really enjoyed reading your post. 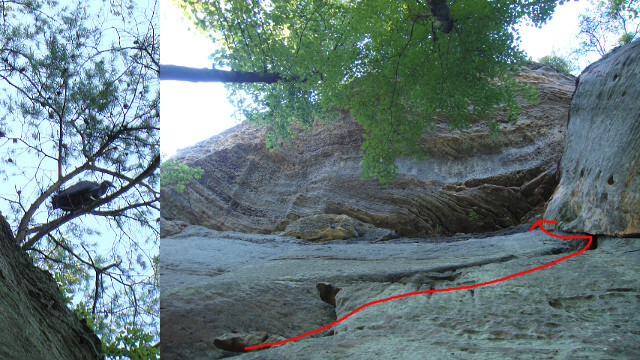 It is refreshing to see someone take the time to document a somewhat unique climbing "adventure" in the Red at length and with pictures. It was an entertaining read and the pictures were well-placed within the text. Really cool that you all were out there exploring and taking a different path. In a word, inspiring. Thanks for taking the time to write that up. Keep on rockin' in a free world. Great account of your adventure! You should post a report every time you 2 go out. You have many questions that may never be answered. There are many routes out there that have no written record for many reasons. Many of us have come across such adventure/epic climbs at the Red over the years. Only to reach the top where fixed gear/webbing, shunts/bolts appear! They may be way off the beaten path or a short approach. I've always told people that if you can see the rock from a road, it most surely has been climbed. Climb Safe. Thanks for the writeup, Jesse. I really hope someone knows some history on this route. We have had one guess of Duke's Day at Pinch-em Tight, however I do not believe this is it. While not a classic, I feel it is a worthwhile route. 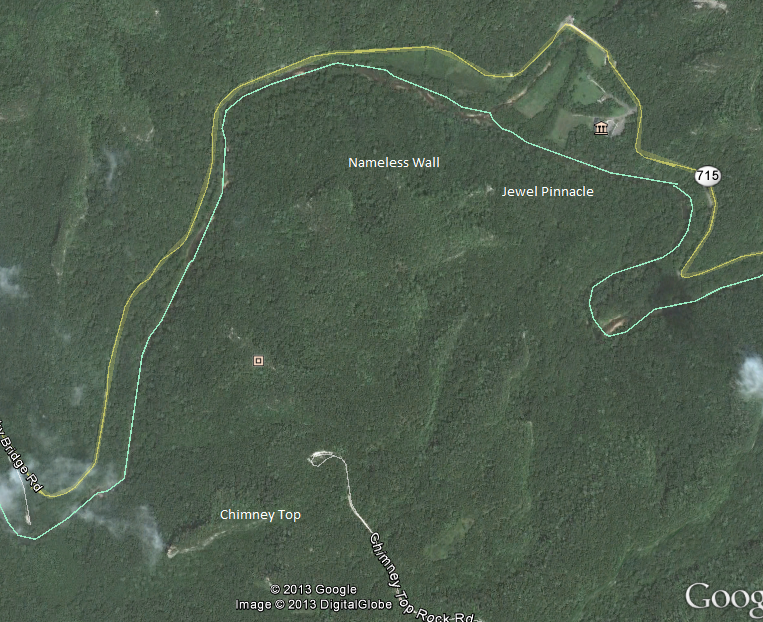 If anyone is over at Jewel Pinnacle and wants to get another decent pitch in, it is not too far of a hike. The new second (or third) traverse pitch however is... adventurous. The exposure on the arete is fantastic, but the protection is not great. You can actually see the arete and roof from 715 on the way in, even in the summer. It really is great to be able to get out and experience some classic adventure down in the Red still, even if it has already been climbed. Chimney Top? 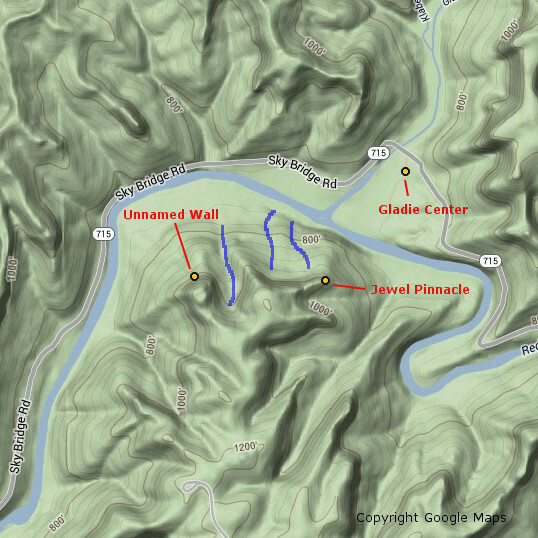 I bet you came up further southwest of Jewel than you think and then shwacked through the three obvious drainages on the topo map. 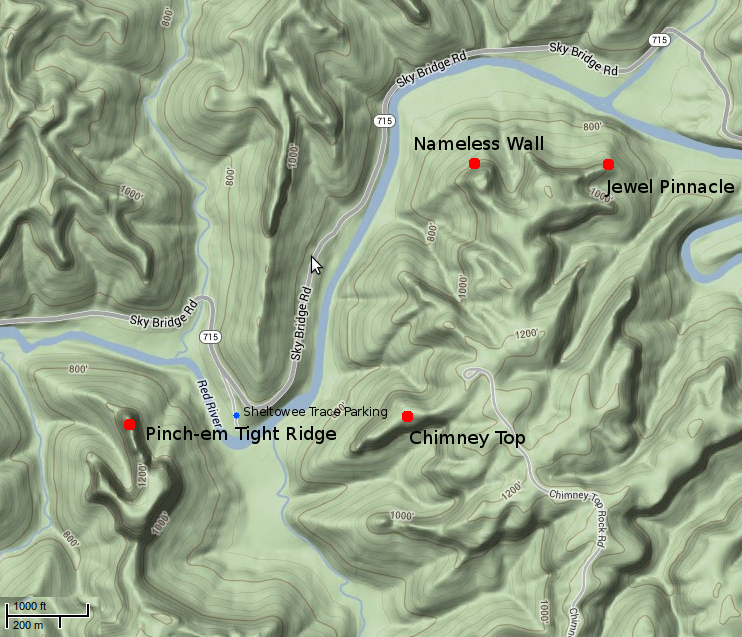 You can see chimney top parking lot in his topo map. It is at the very bottom of the map. I think his route is a bit north of chimney top. I bet they were further southwest than they think. Those first two blue lines in their map are not actual drainages. Oh yeah, and an hour hike would make more sense. Thanks everyone for the kind words and responses. I'm relatively confident in the map and its locations, Dustin. In retrospect I should have brought a GPS to dispel any ambiguity regarding our location. You can see it from the road -- it's not Chimney Top. I would surmise that we weren't anywhere close to that. There is a scale on one of the maps below to estimate distance with. The hour approach time includes parking outside of Gladie, walking down to the river, switching out shoes and fording it, putting shoes back on, and finding the cliff. If we did it again, it wouldn't take nearly as long, I imagine. The three drainages aren't particularly large. The last is moderate. The others are simply topographical dips. There was no running water in any of them. On the map, notice how the contours "V" upstream in those smaller drainages (albeit very slightly). Looking at an aerial makes me even more confident, as we first arrived at the opposite side of the bowl/horseshoe before crossing down and up to the main area. I like and appreciate all the ideas and speculation (Thanks Scott Hammon for the Pinch-em Tight Ridge suggestion). Maybe I will try to look at the raw photos again and see if I can make out any features along the road or in the distance that help pinpoint our location with more confidence. You really think it's only 1000' from Jewel Pinnacle? That's pretty close, like barely 5 minutes of shwacking. Anyway, there are cool unknown walls all over the region, some climbed, some not. I have been consistently amazed by the quantity and quality of rock still out there to be both discovered and rediscovered. It's kind of hilarious that 95% of the climbing "crowd" these days basically never ventures out of the southern region and Muir Valley... Spaas Creek alone has another generation's worth of rock. All the better for us depraved choss hunters!! They have the wall pointed out exactly where it should be on the map. It's not Chimney Top and it is not Pinch-Em Tight. It is definitely un-named. It is smack dab in the middle between Princess Arch and Jewel Pinnacle. Straigt accross the valley if you were looking at it from cloud splitter. I agree that it seems really close, Dustin. Worth considering and factoring into the equation (maybe I am completely off and confused in my descriptions). I think my very poor approach description may be throwing a lot of this off. If you're at Jewel, as Nate said, it's not very far to get over it. Especially once you know where it is. Perhaps we're just really slow at bush whacking (I'm a total whiner when it comes to that). TradMike has the location correct (I forgot about Princess Arch, which we would have likely noted if we had passed it). I've never been to Cloud Splitter, but it would be right across the road looking south. When we go down next weekend, if we drive by, I may try to get a photo from KY-715 (there's a convenient opening in the road that you can see in a few of the photos). Thanks for participating in the conversation, Dustin, milspecmark, and TradMike. Does anyone recognize this route? Same general area but across the road. I can't seem to find anyting on it. Good reason to always keep a smart phone with you and use a topo program. Even in tree cover you will get good enough accuracy to pinpoint location and no cell signal is needed.